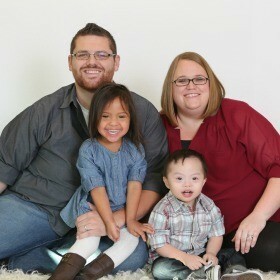 When we first began the adoption process, we did not intend to adopt a child with Down syndrome. As with most parents, the child in our dreams was a healthy child with no significant medical issues. But sometimes reality, especially in the adoption world, throws you a curve that turns out even better than your dreams. 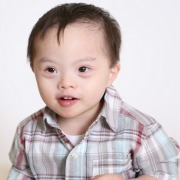 When we got the call that we had been chosen by a birth family to adopt their son who was born with Down syndrome, our initial reaction was a mix of joy and terror. Of course we had indicated that we were open to this scenario, but were we really prepared for what could lay ahead of us? That terror and doubt all melted away the moment we met with the doctors and saw our son’s face. Then life threw us another curve. After spending three days at the hospital, learning everything we could about our son’s genetic disorder and how to care for a child with Down syndrome, his birth family decided to parent him. This of course was a very difficult time for us, but it was also an awakening. We knew now, that we not only had the ability to take on the challenge of raising a child with Down syndrome, but we now felt that it was all part of the universe’s master plan, and we just weren’t aware of it before. We also knew that, living in the U.S. we were at a unique advantage. Our country’s understanding and acceptance of children with Down syndrome and other disabilities has come a long way from the days of secrecy and institutions. We now have an abundance of resources and assistance to help our children with special needs live their lives to the fullest potential. Unfortunately, this is not true in the rest of the world where there is still stigma and shame in having a child with Down syndrome. This is why special needs adoption, both domestically and internationally is so important. Without it, these children could be relegated to a difficult and frustrating life, wanting to flourish but not having the opportunity to do so. We have been fortunate enough now to have added two children, Kayella and Leo, with Down syndrome to our family and get to see them grow and succeed every day. Of course, this does not mean that raising children with Down syndrome is easy. Raising an adopted child is difficult enough with the inherent struggles that their situations can bring, but it is even more so for children with special needs who may find it difficult to fully understand their situation or express their feelings about it. These children often need additional therapy and intervention to help them develop their cognitive and speech skills. They will also need physical and occupational therapy to help counter the weak muscle tone and delayed motor skills associated with Down syndrome. Our children have a combined seven hours of therapy each week, plus early intervention service through the school district. Fortunately we are in a position that allowed my wife to quit her job so she could stay home and focus on the kids’ therapies and services. There are also many other unique medical concerns for these children, including heart, ear, nose, and throat issues, and all of these services and doctor’s visits can be expensive. Even with insurance and assistance programs, the costs of medical services your child with Down syndrome may need can be daunting. There is also still a large misconception that children with Down syndrome are always happy and smiling. While they do have a special ability to brighten any room, they are also very much like any other person with a full range of emotions, including a unique stubbornness that can be quite challenging at times. Like any parent, we’ve experienced our share of tantrums and melt downs in the middle of a crowded store or a multi-day hunger strike because nothing we cook is appetizing to them. There are times I am so frustrated that I would like to break down and join them in a session of crying and screaming. I say these things, not to scare or deter anyone from adopting a child with Down syndrome, but to provide a realistic view of the unique aspects of raising these children. However it is not all that dissimilar to parenting any child, in the end our goal as parents is to provide them the love and support they need to grow into happy and healthy adults. Finally, I will leave you with one piece of advice I give to all prospective adoptive parents: be honest and realistic with what you feel you are capable of, but keep your heart open to the curves life can throw you, it might just turn out better than you could have imagined.